Jackie Estacado might keep a running total of the number of times he's died, but creator Top Cow wants him to add a rebirth to the tally as well. 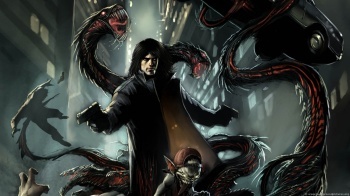 Despite some teasing and poking at the hands of the Unskippable crew, The Darkness - the story of mobster turned monster Jackie Estacado and his quest for vengeance against the men who betrayed him - was pretty well received. Rumors of a sequel to the 2007 shooter have been floating around for some time, and creator Top Cow says that it can see no reason not to make one, once it straightens out a few legal issues. Top Cow's marketing director Atom! Freeman said that there were no specific plans for the sequel, but that it was something that was on the minds of everyone at Top Cow. He said that the issues that needed to be resolved were to do with rights, but they were in the process of being dealt with so that the project could move ahead. Freeman wouldn't go into any further detail, but as Top Cow is the owner of The Darkness property, it seems reasonable to assume that it has some problem it needs to work out with either 2K Games or Starbreeze Studios, which published and developed the first Darkness game respectively.